We need your advice! Ken will have a new album out – Outlaws and Bystanders – by Gulf Wars 2014. We promise this time! Ken had multiple surgeries last year (nothing life-threatening) that basically put him out-of-commission for an entire year. The album was planned for release before the 2013 Gulf Wars event when it all started. But this year we are ready! Ken and Lisa have been rehearsing daily for Ken’s live performance at The Green Dragon tavern (Time and day TBD). There are lots of great songs on the new album, but people will also be expecting to hear some of the old favorites too. That’s where you come in. 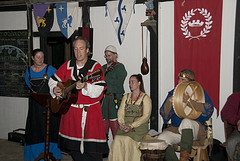 We’ve assumed that certain songs are mandatory, such as Agincourt, Band Of Brothers, The Feast Song, and Son Of The Sea. But there is nothing like hard data to make sure. So we need your help to choose which of Ken’s older songs you would like to make sure he performs at Gulf Wars (you can listen to clips from the current albums below). There is only a limited amount of time, so we can’t absolutely guarantee that every song picked by everybody will make it onto the set list. We will choose the ones with the most votes by the most people to fill out our time-slot. So if you plan or hope to be at Gulf Wars in March, and will be at the concert, please let us know – via that handy comments section below – which of Ken’s songs you would like to be sure will make it onto the set list. That will help us out greatly. Plus it will be more likely that Ken will rehearse those songs so that he does not forget the words or chords during the show;). Definitely ‘Band of Brothers’ & ‘Agincourt’ to me they embody what we are there for. Everything else is a bonus for me!